Browsing through the classifieds can be a boring task. Picking between almost identical models and weighing up pros and cons can get tedious and it’s easy to be distracted – but it all depends what you’re looking for. Seeking out a classic car for weekend fun is much more interesting, but if you’d really rather not bother, we’ve done the hard work for you. Here’s a selection of some of the more interesting classic models from our used cars section. This butch looking 70s roadster has always turned heads and will almost certainly continue to do so for as long as it lives. It does come from that notorious era in British car building history during which strikes were commonplace and things tended to break, but the advertisement suggests that this has been fully restored and the engine rebuilt, since which time it’s covered 13,000 miles. So if you’re in the mood for some classic British open top motoring, complete with V8 engine, look no further. Chances are that you’ll have seen one of these trundling along a local street looking tremendously cute, you’ll have wondered what on Earth it was. Well despite its retro British looks it’s actually a Japanese car that was originally only sold on the Japanese domestic market. Based on the first generation Micra it’s a reasonably hardy little car which is much easier to maintain than a genuine 60s machine but has all the good looks. British buyers cottoned on and now there are loads of imported Figaros on UK roads, but few as pristine as this example, which has covered just 7000 miles. You could be forgiven for confusing the MGB with the Figaro at a glance, but the MG is the real deal. This 1971 model was reshelled in the 90s, so rot shouldn’t be an issue, and it comes with the all important well-documented history file. Not only that, but thanks to its age it’s road tax exempt, which means more money for the inevitable maintenance bills. The 964 series of 911 is extremely desirable, with the traditional Porsche layout of rear mounted aircooled engine and rear wheel drive. The iconic shape barely differs from the first generation 911 and this Targa model benefits from a removable hard top. It’s covered more than 110,000 miles but the engine was rebuilt in 2010, and since then it’s covered 5858 miles, which should put minds at rest when it comes to expensive bills coming up. It’s also had a suspension and brake system overhaul, and comes with a full service history. It’s an automatic, though, which might dull the sportiness for some. 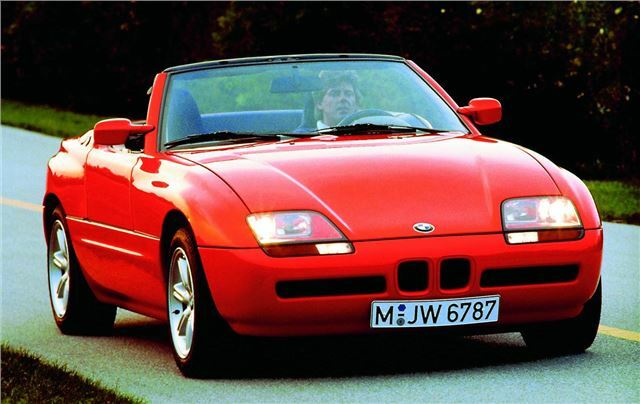 Just 8,000 Z1s were made by BMW in the late 1980s and almost all of them were sold in the German market, so finding one for sale in the UK is difficult at best, and if the exceptionally low mileage figure of 8900 is accurate on this listing it’s likely to be one of the neatest examples around. 170 horsepower comes from a 2.5-litre straight-six, so performance is brisk and matches the outstanding looks. One curious feature is the way in which the doors open – they drop down into the sills rather than swinging out. No matter what you’re looking for, whether a supercar or a classic, a luxury saloon or a city car, you’re sure to find something suitable in our classifieds section.